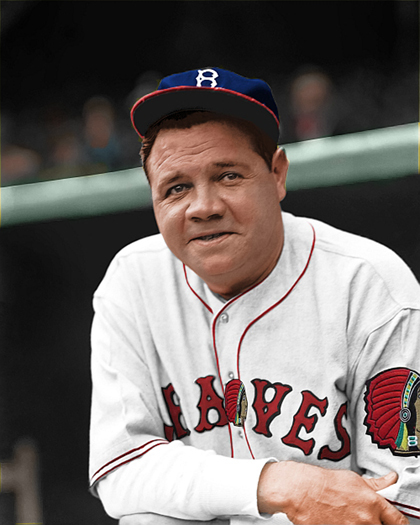 George Herman Ruth (n. Baltimore, 6 de febrero de 1895 - m. Nueva York, 16 de agosto de 1948), más conocido como Babe Ruth, fue uno de los jugadores profesionales de béisbol de Grandes Ligas de mayor talento y más populares de la historia. George Herman "Babe"Ruth, Jr. (February 6, 1895 – August 16, 1948), nicknamed "the Bambino" and "the Sultan of Swat", was an American baseball outfielder and pitcher who played 22 seasons in Major League Baseball (MLB), from 1914 to 1935. Beginning his career as a stellar left-handed pitcher for the Boston Red Sox, Ruth achieved his greatest fame as a slugging outfielder for the New York Yankees.